22nd International Festival of Street Art BuskerBus took place in Krotoszyn (17-19.08.2018) and Zielona Góra (21-22.08.2018). Aerial Manx is a juggler and a contortionist who achieved his three Guinness World Records His signature act is a sword-swallowing backflip. His show is a blend of circus and a freak show. Manx is not afraid of any challenges, and he continues to push boundaries and the limits of his body. Whatever you see, don’t try it at home. 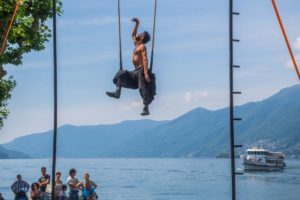 Adriano Cangemi is a circus artist and dancer from Argentina. As a kid, he trained gymnastic. When he was travelling in South America, he discovered juggling and trapeze. Currently, he studies physical theatre in Verscio, Switzerland. His show NAGUAL – Moved by the Wind is a combination of physical and aerial theatre. One performer on stage starts a long pilgrimage between different transformation, trying to find a meeting point of his life. A performance without words, where everything concentrates on the body of the actor. Anna Szlávics and Csilla Ruzic come from Budapest. Anna is a singer, songwriter and guitar player involved in several music projects including Cirkusz-KA ethno-jazz trio with which she has won many music awards, Anna Mur art-pop band, Anna & Márton S. jazzy chanson duo. Since 2006 she has been creating her songs with cultural roots in native Hungarian heritage. She is inspired by the diversity of various music influences of their region and adds a flavour of jazz. Csilla is a painter, composer, and guitarist. She studied fine art, jazz and improvisation studies. She also plays the sitar. Her teacher and music partner is famous Hungarian master sitarists Tóth Szabolcs. 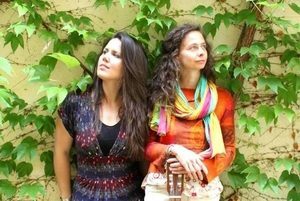 They play classical Indian music melted with modern and jazz pieces composed by Csilla. Lucie Slaninová has been dancing professionally for 10 years. She specializes in various techniques, mainly in different types of belly dance and with props. She is also a yoga teacher. This year, she will present a tribal fusion show with the use of a chair. Originally from Brazil, but he calls Europe home. Diogo Alvares mastered to perfection the art of manipulation. His show Face to Face is a mix of street magic and illusion with a structured routine and improvisation. 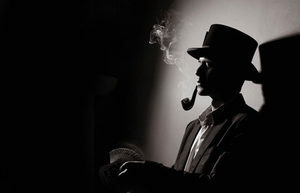 He manipulates all ordinary objects: cards, billiard balls, cigarettes, ropes, etc. without losing control of the performance. 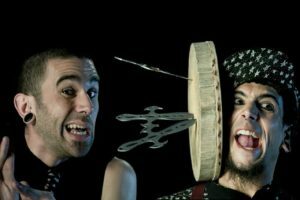 Two extravagant performers bring the oddities of the classic and old “Circus freak”. The fakirism techniques, knife throwing, moments of high tension, comical acts, argument, and disputes amongst them and often with the audience, their passion for risk, their tenderness and innocence. There are many reasons that Stupid Company will give you to stay until the end of the show. 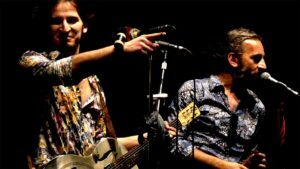 Momolo and Remolacha will perform at BuskerBus for the first time. BuskerBus 2018 prezentuje: Franklin & co.
O swoim pokazie Franklin napisał jedynie “połączenie umiejętności tanecznych i występ do rytmu muzyki”. 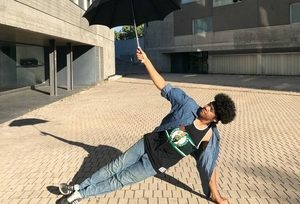 Chociaż jego lakoniczny opis niewiele Wam powie o tym, co możecie zobaczyć, to jeśli lubicie breakdance, koniecznie wpadnijcie zobaczyć tego młodego chłopaka z Madrytu. Jak to mówią, “człowieka określa towarzystwo, w którym się obraca”, a pewnie pamiętacie z poprzednich edycji festiwalu jego szalenie utalentowanych znajomych. Darko Gjurcinovski (Macedonia) has been a street theater artist since 1999. After touring the world with a variety of different companies, in 2014 he created his original one-man show “Someone here is not normal?”. Is a story about one fat person who likes to be a showman. The show is based on the Balkan folklore combined with clownery and juggling techniques. Darko juggles balls, clubs, fire and knives, even on top of a giraffe unicycle in a funny inflatable costume! Gavin has been performing for over 20 years. He returns to BuskerBus after a 15-year break. If you were there, you might remember him as the Leopardman. 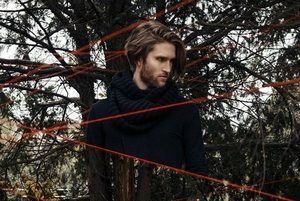 This year as Jack Flash he will present a one-man circus show combining comedy, acrobatics, magic, and juggling with five knives (but don’t worry; he still has all his fingers). You will laugh, you will cheer, and you might even scream when you see him perform a handstand 3.5 meters above the ground. Jess Brien is a performer and yoga instructor from New Zealand. They call her Jess The Mess and 5 minutes into her show you’ll understand why! 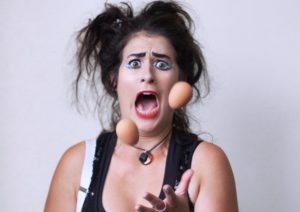 Armed with a sparkly personality, fire, eggs, and some seriously sweet dance moves, she brings you an interactive comedy street show entertaining both little and big kids alike. Kacper is a 21-year-old juggler from Wroclaw. 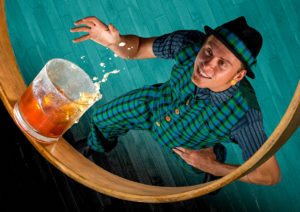 His show is a combination of dangerous circus tricks with a large dose of wit and humor. Despite his young age, Kacper has over 8 years experience in juggling, and he will present its different variations. 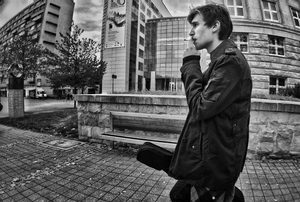 Kubuś has been playing guitar and singing for eight years and has been performing on the street for three years. Without the sound system, he feels like he is playing at home. He will present his songs in dirty, blues style, in which he talks about the most important things in his life. 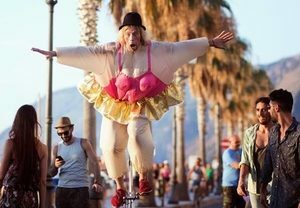 In 2016 Mantega started traveling with his short act “Whisky” and the show “Wonder Drink” that he will present at BuskerBus. Mantega invites the audience to a wordless journey where tons of laughs and gasps of amazement are guaranteed. Ever wanted to be stronger, faster and smarter? Well, your answer is WONDER DRINK! 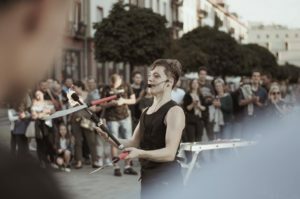 Highly original and innovative, In a show that makes the perfect blend of theater and high-level circus skills, you will see Mantega juggle and manipulate unusual objects such as glasses, ice cubes, and liquids. 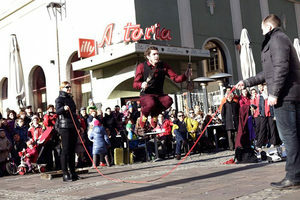 It is a thirty-minute show of contemporary circus where modern juggling techniques are combined with different dance styles and acrobatics. An Argentinian duo NUBE uses handling, balance and choreography with plastic cubes, plastic boxes, blind eyes and chairs. Show: A Tenor. An Hour. 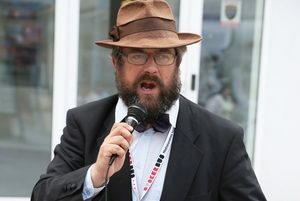 Philip Fairweather is an actor and singer from Exeter in England, who has been based in Wroclaw since 2003, where he has become a well-known figure on the local music scene, appearing at many cultural events. 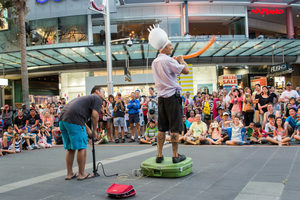 A regular street performer for over 30 years, he first began busking aged 14 in 1986 as a “Saturday job”. In 1995, he took it up full time and toured over 20 countries in Europe. Philip first became involved with BuskerBus in 1999. 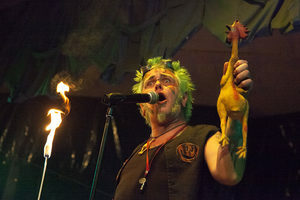 From 2009, he has been the main host and coordinator of the BuskerBus Cabaret. He has been a street performer for 10 years. 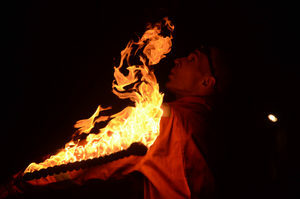 He has come a long way – from juggling somewhere in the corner, blowing soap bubbles, and twisting balloons to a spectacular fire breathing show that became his signature performance. 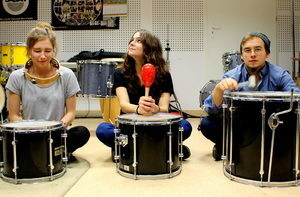 Po3 consists of three students of the music academy in Poznań: Anna Kamińska – vocal, ukulele, Kinga Skrzypińska – guitar, Stanisław Aleksandrowicz – percussion instruments. Each of them would like to add a piece of themselves to the music they create. Something intimate, remarkable, intriguing. Lightly and seriously, cheerfully and sadly, quickly and slowly. “Przebłyski” is a collection of thoughts, feelings, and experiences. “Przebłyski” are words written somewhere on the run, later turned into a song. “Przebłyski” is music that flashed through your ears and later found its shelter in the lyrics. “Przebłyski” are bittersweet moments that accompany us every day. Witnesses say that nothing is impossible for him. A real madman who continually proves that he still has a lot to say on the circus scene.